4116 RW Landscape Rake 6 Ft.
4117 RW Landscape Rake 7 Ft.
4118 RW Landscape Rake 8 Ft.
Price on this item DOES NOT include shipping; shipping added at checkout and is calculated from shipping weight from all items, and is for shipping to locations with normal delivery access in the continental U.S. 48 states; locations in Alaska, Hawaii, and outside the U.S. require additional shipping cost, e-mail us for a shipping quote if needed. For Truck shipments, for the shipping cost shown you must be able to unload the items at the delivery point (lift gate service is extra, please order if needed). Delivery pickup at the terminal can also be requested for no extra charge. Orders that are paid for by credit card must be shipped to the billing address of the credit card, and if the billing address is a PO Box, then payment would have to be by check as most items do not ship by post office. Model 2215B tow behind landscape rake 5 ft. wide with ball hitch coupler for 1 7/8 inch diameter trailer balls. Total rake weight is 217 lbs. ; rake ships by truck. Photo shows OPTIONAL grader blade assembly attached. 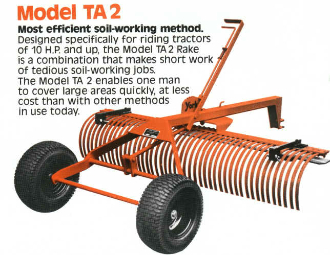 The models TA1 and TA2 York pull behind grading rakes are designed to be pulled behind a garden tractor or atv (the TA1), or larger garden tractors of 10 hp and up (the TA2). York Rakes give you a smooth well groomed surface. York Rakes can also be equiped with the optional grader blade assembly, which can be flipped up when not in use. York Rakes can be use for soil smoothing and preparation at: drives and trails; tennis courts; bridle paths; athletic fields; parking areas; parks and playgrounds; golf courses; cemeteries; cinder tracks; baseball diamonds and other areas.